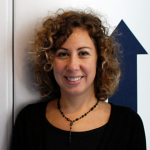 What does upselling mean in the context of eCommerce? As an online retailer, you always need to be convincing your customers to make more purchases or buy more expensive items from your store. This is just the definition of upselling. Luckily, online tools have plenty of different features that can prompt upsells on an eCommerce website. If you are hosting your online store on Shopify, an upsell Shopify app like Perzonalization will be your life-saver. Download your guide for Shopify App Store, full of tips and tricks to help you choose the best apps for your business. What is the relationship between eCommerce product recommendations and upsells? Product recommendations are tools that are commonly used by online retailers. Upsell functionality is also handled by eCommerce product recommendations in the sense that it is just another way of recommending products. Product recommendations look quite similar on different eCommerce environments but what makes a personalization engine unique is its backend capabilities – the ability to analyse real-time online shopping behaviour and derive an understanding to come up with personalized product recommendations. What type of other product recommendation rules exist? Related products: A personalization engine may add value to this type of product recommendations as the term “related products” can be too obscure if there is no shopping context defined. A successful personalized product recommendation is the one that appeals to the online visitor’s unique taste and her instant purchase intention. If that online shopper is reviewing the product page of a blue skirt, recommending her a pair of outdoor boots may not be the right way of ensuring conversions. Thus, a static product recommendations area such as Shopify related products may also not help you as it would not help you personalize your product recommendations. An automated and AI powered personalization app will both act as an online sales rep and boost your conversions. Recently viewed products: Reminding a user of the recent product that he viewed is a good method if you want to convince him to make a purchase from your Shopify website. Cross-sell: These products are usually the complementary items that will match the recent purchase. Recommending headphones for a user who has recently bought a smart phone is a good example to that. Frequently bought together: This is one of the most popular but mis-used terms in the eCommerce literature. FBT products are the ones that go in the same basket, frequently. So in that sense, a skirt and a pair of pants might be FBT products as they are likely to be bought from the same retailer. Thus, a careful analysis of the recent orders shall be made before recommending frequently bought together products. Custom: As an eCommerce owner, you may define your own rules and use them in your product recommendations. There might be certain categories or collections that you want to feature on your online store. eCommerce product recommendations will give you a means to display the products that you want to prioritize for the sake of your business. 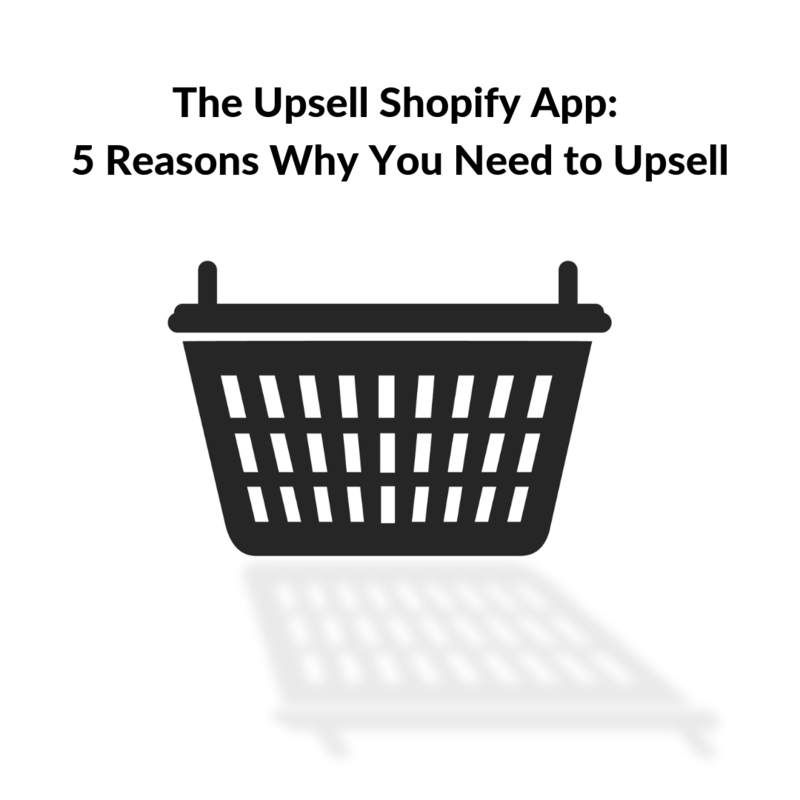 The upsell Shopify app: Why do you need it for your eCommerce business? How many times have you left a retail store with exactly the same number of products that you initially planned to shop for? Or how many times have you spent the exact same budget that you planned to spend? I assume that the answer is less than 5. So, in only a very few occasions – we as the shoppers – leave those stores with pride! Today, the trade marketers are so successful that they are able to tempt you to make even 4-5 additional purchases during an ordinary shopping trip. Upsell techniques are applied in physical environments via baskets and other special display units. The equivalent of these is the upsell Shopify app that will pull your online visitors and make them buy more! The equivalent of special display units in the supermarkets is the upsell Shopify app that will pull your online visitors and make them buy more Tweet This! A Shopify upsell app is also a type of Shopify recommended products but its sole objective is to motivate purchases of more expensive products from the same category or additional items. The good thing about an upsell Shopify app like Perzonalization is that, you only install the app in a minute and the app does the rest. It keeps track of your inventory, the clickstream behaviour and your orders. So in this way, when you need to upsell, the app automatically showcases more expensive or additional products for your shoppers. You only sit and watch the addional revenues that keep flowing to your back account. An upsell Shopify app provides a wide array benefits for eCommerce owners. 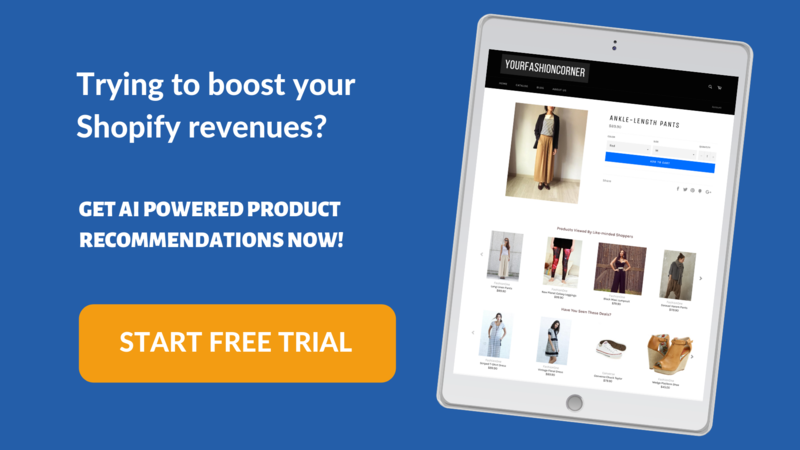 Whether it be productivity or reaching commercial targets, a Shopify upsell app like Perzonalization will prove itself to be a high ROI investment for your business. Sales uplift: The most obvious outcome of an upsell Shopify app is the sales boost it provides. When the user is prompted to buy a more expensive version of the viewed product, an instant lift in sales is realised. Higher average order value: Upsell can also mean the sales of an additional item. In this case, more items will be included in a single basket making it more profitable for the eCommerce website. A better user interface: When upsell offers are displayed in the form of Shopify recommended products, the product recommendations block adds value to the general user experince. The Shopify website looks more professional via upsell offers. Thus, the upsell area will be a great addition to your Shopify theme. Shopify one click upsell feature of the app will also help yours add new products to their carts without a hassle. More productivity: When you install an upsell Shopify app, the upsell products will be automatically showcased to your users so you will no longer need to manually select upsell products. You can concentrate on other business tasks and be more productive. Higher loyalty and stickiness: Consumers love it when they feel that the online store understands their needs and talks with them in a personalized way. A personalized upsell Shopify app can help increase loyalty among your users as they will start to see a curated list of upsell products via the Shopify upsell app. The rise in the number of dropshipping stores has resulted in increased competition for the existing Shopify websites. Today, an online shopper has many options when it comes to shopping – fromm billions of products being sold online to millions of small eCommerce websites trying to showcase their portfolios online. If you are a Shopify merchant, the value of an existing user has increased tenfold after competion has arrived. Thus an Upsell Shopify app has become a must-have for your store in the sense that increasing the basket size of an existing customer has become the most logical method in ensuring the sustainability of your business.